> Why Buy A HeatPump? > What Makes Thermasys Different? Thermasys supply and install Air Source & Ground Source HeatPumps which are suitable for your all of your Hot Water & Heating requirements. No matter how large or small the building, we will have a Heatpump system to meet your needs. Our systems range from a single 4kW unit to multiple units with a single controller producing around 300kW. Domestic hot water storage is also provided using 180 to 1000 litre pressurised vessels designed specifically for our HeatPumps. Unlike most renewable energy companies we provide a full package of installation and design, we also carry out an initial technical site survey free of charge. We will guide you through each stage of the project from design to commissioning. If you are considering a HeatPump and require more information please send us your details via our enquiry page or simply call us on 01142 561552. Thank you for taking the time to view our site. Brine* circulates in a collector coil and absorbs the Heatenergy from bedrock, ground, air or water. At the Heatexchanger (evaporator) the tepid brine in the collector coil meets the ice-cold refrigerant** in the Heatpump, which is then Heated a few degrees and evaporates. Then, a compressor compresses the refrigerant. 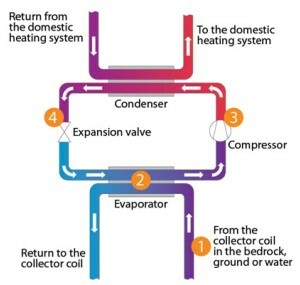 The Heatthat is then generated is transferred via a Heatexchanger (condenser) to the house's Heating system. The refrigerant circulates and an expansion valve lowers the pressure and the refrigerant becomes cold again. The process begins again when the refrigerant meets the tepid brine from the collector coil. * The brine is a mixture that cannot freeze, for example alcohol or glycol. ** Modern environmentally sound refrigerant are used, e.g. hydrocarbons and carbon dioxide. Formerly, freon was used. Please browse our website for more information about Ground and Air Source Heat Pumps, Underfloor Heating, Wind Turbines, Insulation Materials & Screed, Solar/Thermal Hot Water Production and Wood Burning Stoves then contact us on 01142 561552 or e-mail us on enquiries@thermasys.co.uk.